The devastation caused by Hurricane Harvey has left many people putting their lives back together. It's a difficult time for everyone and I've joined forces with fellow food bloggers by participating in Food Bloggers For Texas. This culinary blog event highlights recipes inspired by Texas with the hopes our readers become inspired as well... not just to make the recipes we share but to also learn about some reputable charities to donate to for our friends and families affected by Hurricane Harvey. It's a fun and delicious way to celebrate Texas through food and all the wonderful recipes inspired by the state while helping those in need. When it comes to baking, cookies, cakes, brownies and bars are usually in my repertoire... not so much pastries. So I wanted to step outside of my usual baking choices. 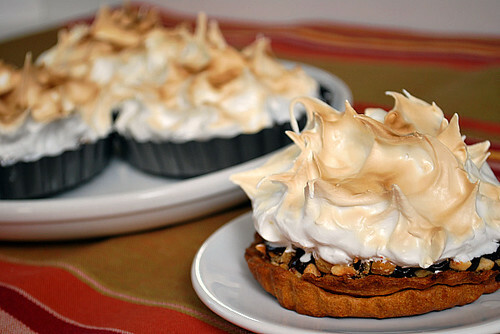 These Texas Big Hairs Chocolate Hazelnut Meringue Tarts start out with a simple tart dough made with toasted hazelnuts, butter, powdered sugar, flour and Frangelico liqueur. If you ask me, anything with a little liqueur has to be good, right?! Using a mixer fitted with a paddle attachment, cream the butter and sugar in a large bowl at medium-high speed until fluffy, about 3 minutes. Mix in the Frangelico liqueur and salt. Gradually add the flour and combine on low speed until just incorporated. Add the hazelnuts and mix on low speed just until incorporated. Form the dough into a ball, wrap in plastic wrap, and refrigerate for 30 minutes. Just look at that! Mmmmm! 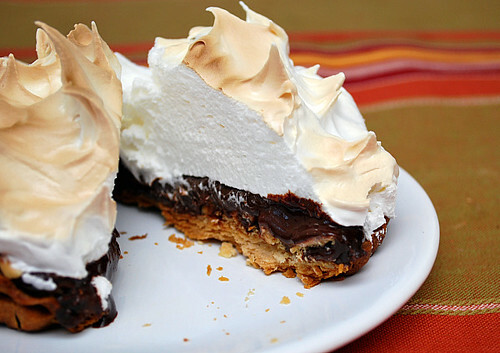 I love the contrast of the fluffy meringue and rich ganache. I wish I could swipe a bite! What a sweet tribute to Texas! I couldn't wait to see what recipe followed this name. What a fun and tasty looking dessert. I've been drooling over this since I saw it in the link this morning. Each layer sounds delicious! Wow they look gorgeous and I bet they taste even better. Love hazelnut. This looks so decadent!